Manufacturer & Exporter of Stone Items & Stone Studded Elephant. Our product range also comprises of Blue Pottery Item, Lac Items and Marble Items. 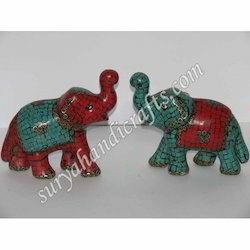 We are engaged in offering the qualitative Stone Studded Elephants. With the help of our experienced artisans, we provide astonishing and attractive patterns to the product. It is made up of various colourful stones to enhance the glory of the product. We are the leading manufacturers and exporters worldwide. We are habituated to meet the national and international standards. These are available in various sizes as per the client requirement.